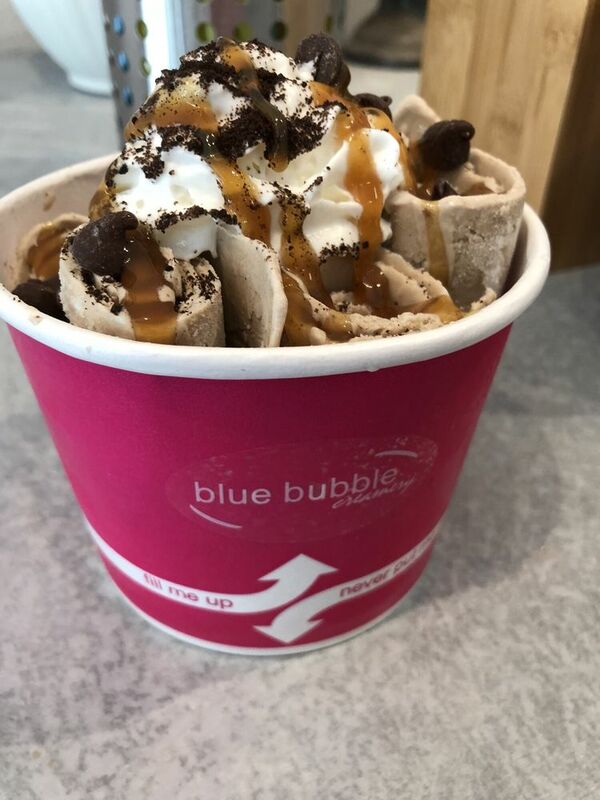 Here at Blue Bubble Creamery, we specialize in ice cream rolls originated from Thailand and freshly brewed boba tea drinks. Offering great customer service and a welcoming atmosphere, we hope to establish the aloha spirit with all patrons. 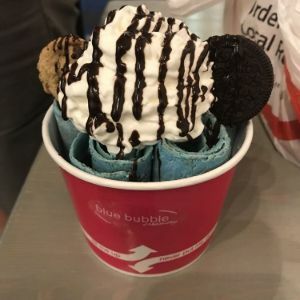 95390 Kuahelani Ave #1B, Mililani, HI 96789 Here at Blue Bubble Creamery, we specialize in ice cream rolls originated from Thailand and freshly brewed boba tea drinks. Offering great customer service and a welcoming atmosphere, we hope to establish the aloha spirit with all patrons. Blue base, Oreo & Chocolate Chip Cookie mixed in. Toppings: Oreo, Chocolate Chip, & Chocolate Syrup. Base & Mix In: Original Base & Mint Oreos. Toppings: Mint Oreo, Oreo Crumbs, Chocolate Syrup. Base & Mix In: Matcha Base & Azuki Beans. Toppings: Mochi, Coconut Syrup, & Condensed Milk. Base & Mix In: Original Base, Strawberries, & Strawberry Wafers. 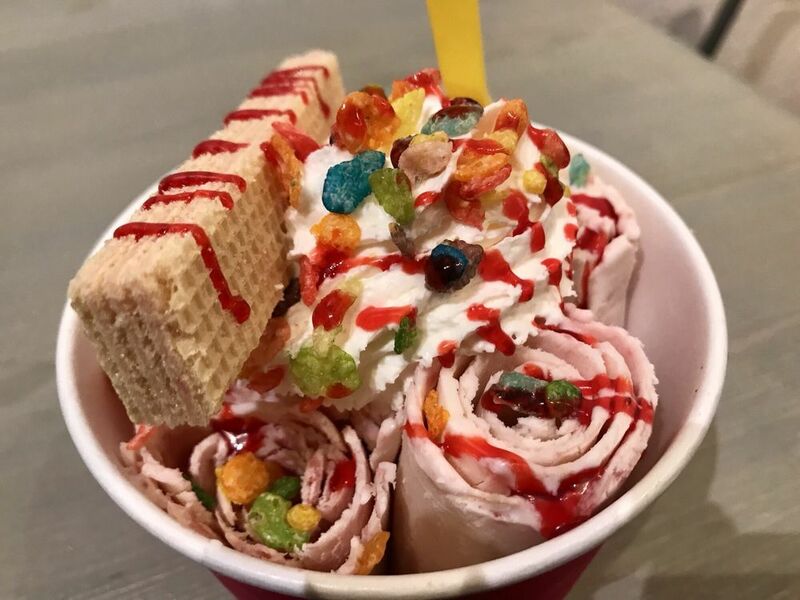 Toppings: Fruity Pebbles, Strawberry Wafer, & Strawberry Syrup. Base & Mix In: Chocolate Base & Brownie. Toppings: Pocky Sticks, Cocoa Pebbles, & Chocolate Syrup. Base & Mix In: Ube Base, Taro Cookie, & Coconut Syrup. Toppings: Mochi, Vanilla Wafer, & Condensed Milk. Base & Mix In: Original Base & Mocha Powder. 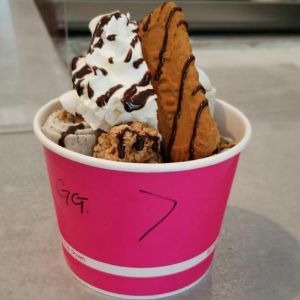 Toppings: Chocolate Chips, Oreo Crumbs, & Caramel Syrup. Base & Mix In: Original Base, Coconut Powder, Strawberries, & Strawberry Wafer. Toppings: Coconut Flakes, Pineapples, & Strawberry Syrup. Base & Mix In: Original Base, Graham Cracker & Chocolate Syrup. 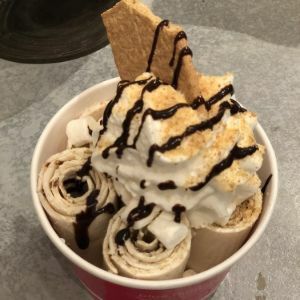 Toppings: Marshmallows, Graham Cracker, Graham Cracker Crumbs, & Chocolate Syrup. Base & Mix In: Blue Base & Cotton Candy Powder. 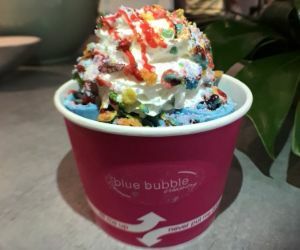 Toppings: Cotton Candy Bits, Fruity Pebbles, & Strawberry Syrup. Base & Mix In: Original Base, Honeydew Powder, & Vanilla Wafer. Toppings: Boba, Mochi, & Condensed Milk. Base & Mix In: Original Base, Black Sesame & Resse's Peanut Butter Cup. Toppings: Granola, Biscoff Cookie, & Chocolate Syrup. Pick your base, pick your mix in, & pick your toppings. Blue vanilla base, Oreos, & Chocolate Chip Cookies. Topped off with chocolate walls, chocolate syrup, oreo & chocolate chips cookies. Blended vanilla base, mint Oreos. Topped with chocolate walls, chocolate syrup, 1 mint Oreo & Oreo crumbs. Blended matcha base & azuki beans. Topped off with Thai & coconut walls, Thai & coconut syrup, mochi. Blended strawberries, & fruity pebbles. Topped off with strawberry walls, strawberry syrup, 1 strawberry wafer, & fruity pebbles. Blended chocolate base & brownie. 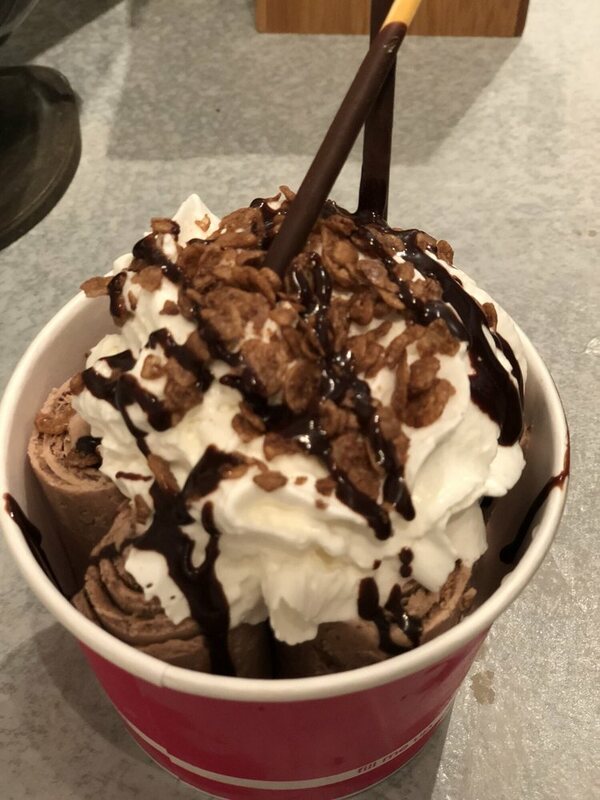 Topped off with chocolate walls, chocolate syrup, cocoa pebbles, & 2 pocky sticks. Blended taro base. 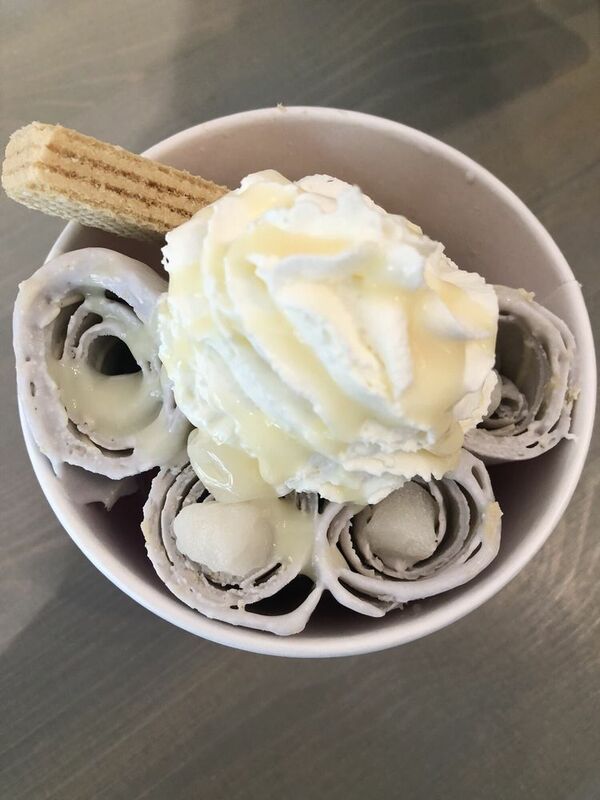 Topped with Thai & coconut walls, Thai & coconut syrup, mochi, & 1 vanilla wafer. Blended mocha base, chocolate chips, & Oreos. Topped off with caramel walls, caramel syrup, 1 Biscoff cookie, & Oreo crumbs. Blended coconut base, strawberries & pineapples. Topped off with strawberry walls, strawberry syrup, & coconut flakes. Blended vanilla base & graham crackers. Topped off with chocolate walls, chocolate syrup, 1 graham cracker, & marshmallows. Blended cotton candy base. Topped off with strawberry walls, strawberry syrup, 1/2 spoon cotton bits, & fruity pebbles. Blended honeydew base. Topped off with Thai walls, Thai syrup, 1/2 scoop boba & mochi. Resse's peanut butter cups & black sesame base. Topped off with chocolate walls, chocolate syrup, granola, & 1 Biscoff cookie.